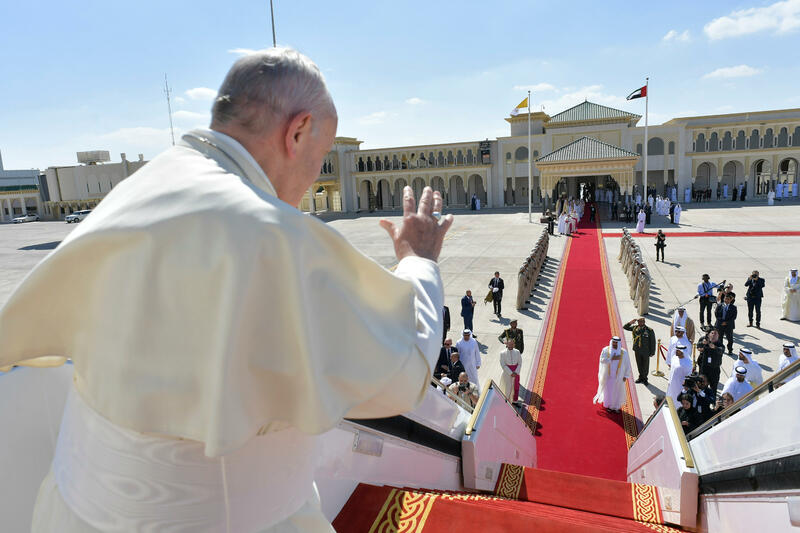 At 12.50 p.m. local time (9.50 in Rome), Pope Francis arrived at the Presidential Airport of Abu Dhabi where the farewell ceremony took place prior to leaving the United Arab Emirates. Upon arrival, the Pope was received by the Crown Prince, His Highness Sheikh Mohammed bin Zayed Al Nahyan. The Holy Father and the Crown Prince were then greeted by Cardinal Secretary of State Pietro Parolin; Cardinal Leonardo Sandri, prefect of the Congregation for the Oriental Churches; Cardinal Fernando Filoni, prefect of the Congregation for the Evangelization of Peoples; H.E. Msgr. Edgar Peña Parra, substitute of the Secretariat of State; H.E. Msgr. Miguel Ángel Ayuso Guixot, M.C.C.J., secretary of the Pontifical Council for Interreligious Dialogue; the United Arab Emirates delegation and local dignitaries. Pope Francis then boarded an Etihad B787 to return to Italy.